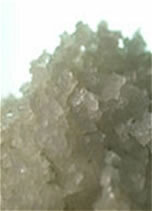 Sea Star Sea Salt is actually an agricultural crop! It is hand harvested once a year by Holly’s partner and salt farmer Sylvain Le Duc. Sylvain farms Sea Star in the traditional (and now rare) centuries-old manner: when the climate is exactly right, the perfect salt crystals form below the water’s surface directly on the blue-green algae clay that contributes to the salts purity and mineral content. The pristine salt crystals are then carefully collected by hand using a special wood tool. That's Sylvain in the turquoise shirt collecting Sea Star in our pristine salt beds. He's very picky about quality, and protecting nature. We love that about him! Sea Star is organic, rare, a whole food and not a processed chemical like most sea salt. Remember: if the salt is unprocessed, everything that is in the water is in the salt. So we are proud of the origin of Sea Star - born in the cleanest ocean water in the world! Taste the difference.